Raul Mondesi talking to reporters about the lawsuit against him. "I will not give Mario Guerrero a peny of my money" said Raul during an interview in Santo Domingo. In a report in local news paper Raul talked about his legal issues. In a recent news Guerrero lawyer made a public announcment to Mondesi to settle things with his client, Mondesi answer was NO. Mondesi said that Guerrero met him in 1992, six years later of his signature with the Dodgers, he said that former pitcher Juan Guzman is being forced to be paid or to have the risk of loosing US$111,111 in legal expenses. Guerrero has invited Mondesi to talk and settle off court, Raul declined the invitation and is willing to go as far as is needed, he said that if he settle or pay Guerrero he will do the same to other players. 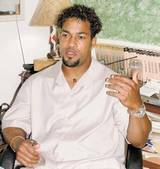 Former Blue Jay George Bell is calling for Unity among Dominican Player to stop Guerrero from this. "Raul Mondesi, Juan Guzman, Geronimo Berroa and Neifi Perez can count with me because it's time to stop this", said Bell. he added "Mario Guerrero has no friends, Mario is doing big damage to those players", "I helped Juan Guzman when we were in Toronto,but what can Mario Guerrero can teach him about pitching?" "Mario can't teach baseball, if he were capable of teaching baseball he had to be working with his brother and nephews", his brother is Epy Guerrero, former Toronto Scout. Raul Mondesi is mad with his agent Jeff Moorad because we waited until the last minute to negatiate my contract and gave me few options, said Mondesi. Hey I love the new look to your blog. Man I gotta change my blog too. Raul Mondesi is such a wonderful person. He offered to let me borrow his Porsche after my car was towed. Wow, how incredible. I didn't take him up on the offer... but I've seen the generosity he's displayed to his teammates and to the Pirate fans. Raul you are definitely missed in Pittsburgh. I wish him the best and back his decision 110%. Ups and Downs, Surprises of the first month.